Here I am with one today. And I am back not with any mediocre chocolate recipes out there. Recipes that uses apf in abundance or that depend on eggs for their texture and binding. Nope! Nope! Nothing like that is happening here this fine morning! Also did I tell you these are the most easy chocolate cupcakes you will ever make! You don’t need any special ingredients, not even a mixer. Just your two good old hands, a mixing bowl and a spatula. And you are all set. How this most moist, light and easy chocolate cupcakes recipe was born! Two days ago, thoughts in my chocolate obsessed brain- I desperately want a chocolate cupcake Neha!! A soft, moist, fluffy and a rich one. I don’t want it to be fudgy ( fudgy is for brownies!) or dense for heaven’s sake! Mind if you don’t add eggs in it today? What if the bake is a healthier version than the usuals. Okay now stop it you silly brain of mine. Have you lost it! That’s being too ambitious for a single bake. Also the one that involves chocolate! Go away you crazy thoughts!! Okay enough talking. Lets get to work! I love my cupcakes light, moist and flavor rich by all means. To achieve this with semolina and no eggs wasn’t some child’s task. I had to try, test and re-test the recipe several times to get here. Some bakes were hard, sometimes the batter was too thin and the cupcakes ended up way to moist. Phewwww. But here I have it in the fourth try! 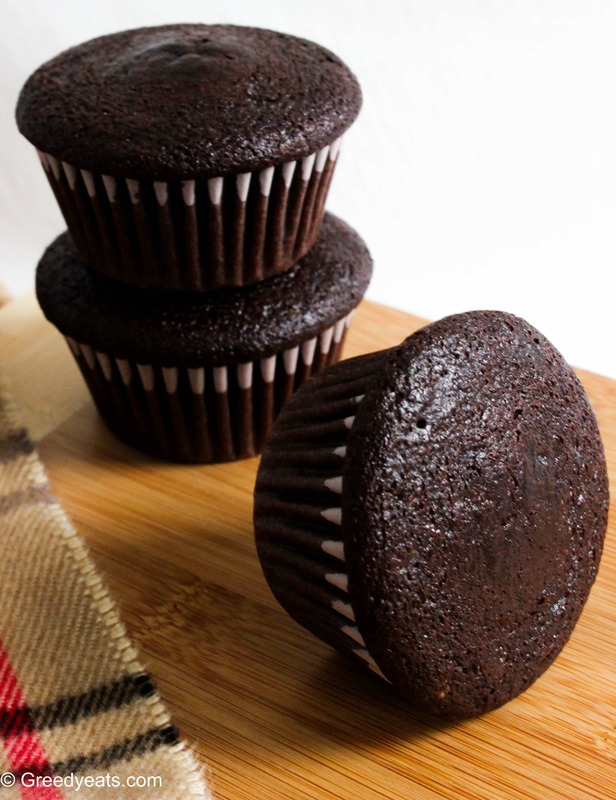 A perfect balance of liquids to semolina+cocoa powder for these lovely and rich, flat top cupcakes. You can make your own butter milk at home? In this recipe we will add 1 tbsp of flavorless vinegar to 2/3 cup of warm milk. And that’s your buttermilk substitute. The mix shown above will be very thick. Don’t mix it too vigorously and let it rest for 15-20 mns. I know. That’s the hard bit. But remember no apf cupcakes? 😉 Then goes in oil, sugar, cocoa, leaveners, some vanilla. We will bake the cupcakes at a lower temperature comparatively, so that all the liquid batter does not ooze out of the liners. Do not fill your cupcakes more than 2/3 of the liners, else the batter will overflow while baking. Don’t be tempted to open your oven at all here before these bake. Or the cupcakes will sink in the middle. Let the cupcakes cool down a little bit inside the oven with door closed. This will prevent the cupcakes from sinking. Just take care of all the DOs and DONTs. And you will be rewarded with beautiful cupcakes, I bet! Take it from me you can not even know that these are healthy or not made with all purpose flour. Or even that these have no eggs in them! Just have a look here. Can you see all those wonderful air pockets? Semolina did not make the cupcakes dense or hard. Infact it helped with that lift of these cupcakes. Now you can have these cupcakes on their own. Shhh, I did not say this! But topping them with this frosting is a complete dessert meal. 😉 We will begin with a cup of whipping cream. Add some sugar to it and whip the cream till soft peak stage. Mix in some homemade strawberry jam or even market bought one. Chill it and frost. Strawberry heaven it is! I would strongly suggest you make homemade fresh strawberry jam for this frosting if you can spare sometime. It tastes the best. Suggestion: Make the strawberry jam a day before. So that you aren’t rushed to make the frosting. Also your jam will have plenty of time to come to room temperature this way. Caution: We need to use ONLY cooled jam here! Just puree your strawberries and reduce them on a gas stove till it thickens to a jam like consistency. Cool it down and add to your cream. You will need about 5 tablespoons for this recipe. No need to strain the puree. Looking for more bakes to frost this luxurious and shiny frosting on? Try it on this lemon flavored cake here. Or how does the idea of orange strawberry cake sound to you? Yum! Love Strawberry??? Try my ridiculously sized strawberry cookies next! So are you ready to bake the most amazing and playfully easy chocolate cupcakes on earth? Easy chocolate cupcakes that are egg free and are so moist, light and chocolatey that this one is sure to be added to your ''chocolate family'' recipes! Also these are frosted with pipeable whipped strawberry cream frosting!!! 1. Preheat your oven to 320 deg F and line a baking pan with liners. Set aside. 2. Warm the milk and soak semolina in it. Add vinegar and salt. Mix lightly and keep aside for 15-20 minutes. 3. Meanwhile sift cocoa, baking powder and baking soda together. After 20 minutes, add oil, powdered sugar and vanilla to the semolina batter and mix. If you find it tough to mix, you may add 1-2 tbsp of the measured 2/3 cup water. I usually am able to mix it without any water. 4. Add sifted cocoa+baking powder+baking soda to the semolina batter and mix well. Add instant coffee to water and heat it. Mix this hot coffee solution to the batter. Mix well until smooth. 5. Pour the batter into liners. Fill only 2/3 of the liners. No more please. Bake these for 24 minutes. And let them cool down in the oven only, doors closed! 6. Take them out after 10 minutes. And allow to cool down further. 7. For the frosting, pour cool whipping cream in cool bowl, add sugar and whip until soft peak stage. 8. Slowly incorporate jam to the cream and food coloring(if adding). Mix just until combined. 9. Keep the cream in fridge till ready to use, Frost as desired. You may keep unfrosted cupcakes stored in an air tight container at room temperature. Or you may keep the frosted ones in fridge for upto 5 days. You can replace semolina with all purpose flour at ease. 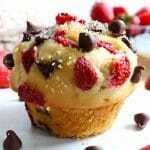 Results in super soft and moist cupcakes that you will bake again and again. Don't be tempted to open your oven at all here before these bake. Or the cupcakes will sink in the middle. It’s about time! Ha ha. Thanks for the chocolate and that looks so rich! The pink frosting is such a nice contrast. Love it! You are very welcome!! Hope you get to try this recipe. Thanks for the wonderful share, hope to try it out sometime! Wow..looks lovely.Will surely try.How much is 1cup in grams ? Thanks Neha! 1 cup accommodates 167 gms of semolina. Let me know how it turns out for you. These chocolate cupcakes look so moist and fluffy! 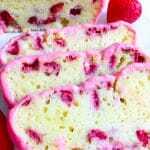 And I love the rich colour of the strawberry frosting! Perfect recipe for Valentine’s Day! Can u post which semolina did u use?? Wow! These look positively scrumptious – so rich, and that texture – my mouth is watering! I love the strawberry frosting, too! Thanks for the rrecipe! Mmm this looks so good. I’ve seen many vegan recipes using vinegar and plant milk to make buttermilk, but never seen in a recipe for cows milk or even buttermilk. I love that your used semolina too. Can’t wait to try these out. How much is 2/3 cup water in ml ? Great, inviting composition ! Thank you ! You said it right Deborah. I am so glad you liked these. Which cup are you referring to Pooja? If you mean a standard liquid measuring one (like you said ml), it is always 250. 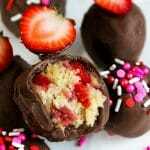 Chocolate and strawberry are good combos. I love the fluffy texture and moistened look–so inviting. Would definitely try this out! Thanks Lily! It is indeed the moistest chocolate cake you will ever taste. 🙂 Would love to know how you like it! These look gorgeous! The contrasting colors here look so pretty you wouldn’t want to eat them. But of course I would because that recipe is awesome. I say keep the chocolate recipes coming! Thank you for the recipe , can you please add measurements in grams and ml? as cut size varies, gm ad ml will help! Sure will do Shrutika. 🙂 Let me know how they turn out! can you share tin size and baking time to bake a cake and not cup cakes? You can bake this as cake in two 6 inches pans for 30-35 minutes at 350 deg F Annie! Wow! It looks wonderful,Can I substitute semolina with wheat or WWF? I’d suggest all purpose flour Deepika! U have mentioned 150g as 3/4cup for sugar and 50g as 1/2cup for cocoa powder. I’m little bit confused. Can u explain me this? Thanks for this lovely healthy yummy receipe. Initially i wasnt sure that sooji might actually give the same texture as apf. I followed all your instructions and the cupcakes turned out moist fluffy n well!! So happy to hear this Salonee! I too was doubtful replacing all the all purpose flour with semolina. But these cupcakes won! Will sure do more such posts. Stay tuned. This looks great! Cannot wait to try. In the ingredients section you mentioned 110 ml water. In the instructions you mentioned 1-2 table spoons of 2/3 cup water. Can you please specify how much water is needed total? Hey you don’t mention the temperature to bake these lovely cupcakes. Can you please tell me the temperature? Hi! It is mentioned in the first step of instructions. 🙂 I bake them at 320 deg F. Enjoy!